Our low ground pressure Cat Bulldozer is used for initial levelling of the subsoil, which is shown here. It can then be used to push on the topsoil. This is done with a laser levelling system. Once the levels are in, the main drains are installed down to depths of 1000mm, followed by the lateral drains to a depth of 600mm. The machine shown is a AFT Whizzwheel - capable of digging trenches 25- 150mm wide. The spoil can be collected and removed from site. The pipe and gravel are inserted simultaneously with trenching using our modified gravel dumper. The Cat D3 can be seen here working on the pitch in a top specification football stadium. The final levels are installed with our Blec Laser Grader. The finished grade is between +/- 10mm. If necessary, the stone can be completely removed from site using our stone picker. This machine sifts through the top 3" of soil and collects stones bigger than 25mm. 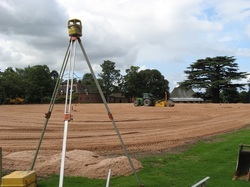 With the drainage system completed, the surface can be prepared for seed. To create a suitable seed bed we use our stone burier. It is also used to mix sand in with the soil. This works the soil and creates a medium suitable for a good, healthy root structure. Where further drainage is required, sand may be mixed with the soil at this stage using the stone burier as shown in this picture. This creates a sand amelioration and a perfect seed bed. The pitch is then seeded. 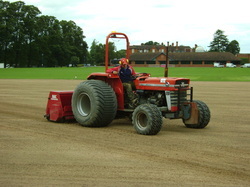 Once the surface has been prepared the seed can then be sown with the seed drill and left to germinate. Once germinated, the grass can be left to establish with natural rainfall. 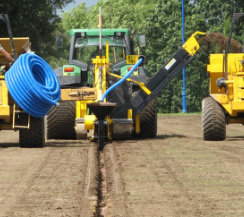 If the pitch is required quickly the establishment period can be reduced by irrigation. This field was for a large Japanese Manufacturing company. The site was levelled, drained, stone removed and buried, then seeded and maintained until the grass was well established and ready for playing. The result is a top quality sports pitch that can be used all year round. If an instant lawn or pitch is required - turf can be laid. 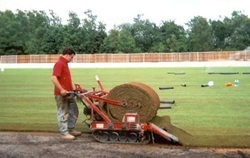 Sports fields can be turfed using "big rolls" as seen below, smaller areas using standard small rolls. 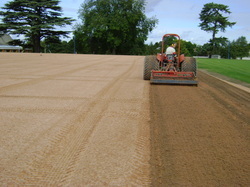 The surface is prepared as for seeding above, and then the turf rolled out to leave a finished pitch. 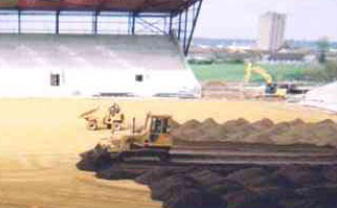 The turf must be watered correctly, and the pitch will then be ready for use in 5-6 weeks, as seen to the right.